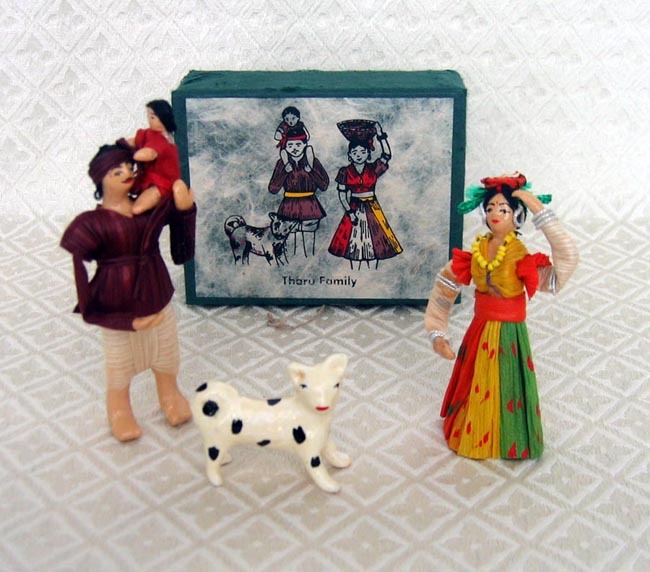 This handcrafted Holy Family is made by rural women in Nepal. There are four families in the set, each representing a Nepali ethnic group: a Tharu family, a Sherpa family, a Newar family, and a Gurung family. Each family is shown in a traditional Nepali costume. The body of these dolls is made of recycled wooden products created in wax and dressed with dyed corn husks. The adult figures stand approximately 4 inches tall. The organization is a women producer’s marketing cooperative established in 1992. The major objectives of its establishment was to bring women to the forefront of economic activities through development and enhancement of entrepreneurship in them and assisting enterprises owned and/or run by women in the area of marketing, productivity and quality improvement and others. The cooperative has been assisting in developing entrepreneurship in Nepalese women from urban and rural areas and in product innovation/modification and quality improvement. The cooperative regularly imparts knowledge and skills through training, observational study, and programs. The programs undertaken by the cooperative have helped improve sales of these women’s products. The center provides employment for 50 women.